What’s the Italian word for entrepreneur? SETsquared has selected some of Italy’s brightest students for an intensive one-week entrepreneurship programme in the UK. Fifteen Italian students will learn from experienced UK entrepreneurs and innovators in an intensive week-long Programme provided by the SETsquared partnership of the Universities of Bath, Bristol, Exeter, Southampton and Surrey. 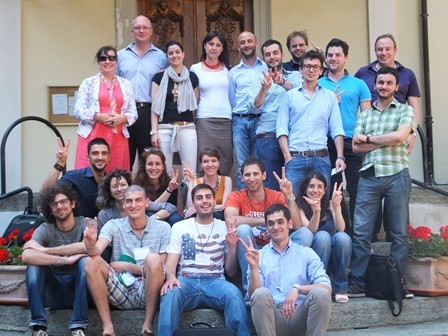 The participants were selected earlier this summer by SETsquared staffers Karen Brooks, Simon Bond and David Bream during a weekend bootcamp in Bard, Italy. The bootcamp helped the students develop their business ideas with seminars on “the perfect pitch” and making your business investor ready. The weekend culminated in a pitching session with the best teams being selected to attend the Bath Entrepreneurship Programme, which is run in conjunction with the University of Bath’s School of Management. The Entrepreneurship Programme is an intensive, practical course, which helps students to develop a business plan in a week. It combines sessions from entrepreneurs and investors with taught lectures and small-group workshops. SETsquared’s services in Italy are funded by Fondazione CRT, a non-profit organization dedicated to the economical, social and cultural development of Piemonte and the Valle d’Aosta region. Support was also provided by UK Trade & Investment (UKTI).